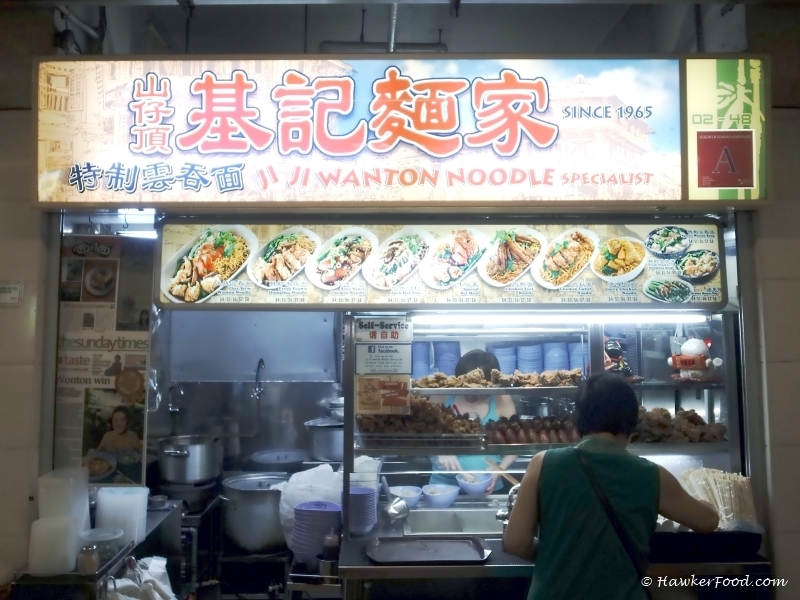 Hong Lim Market and Food Centre is a good place for great hawker food; one of which is Ji Ji Wanton Noodle Specialist 山仔顶基记面家. This is a stall helmed by a mother and her two beautiful daughters. The mother can be seen in the picture at the preparation stall on the left while the queue is snaking at the main stall adjacent to it. The signboard tells you they have been in business since 1965 which means they are also celebrating their Golden Jubilee together with Singapore. 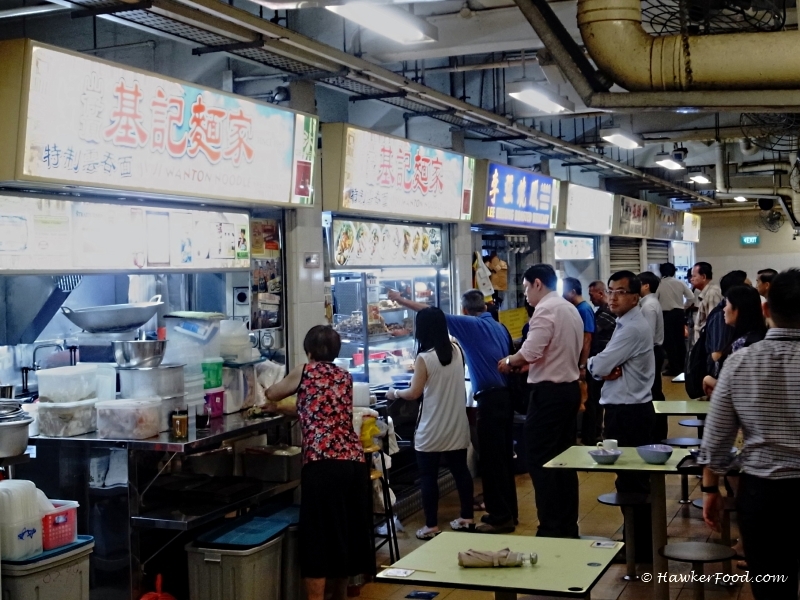 A fantastic milestone and they have been running for three generations from a roadside stall and into a Hawker Centre, this is indeed a great example of a Singapore business that has evolved since Singapore’s independence in 1965. 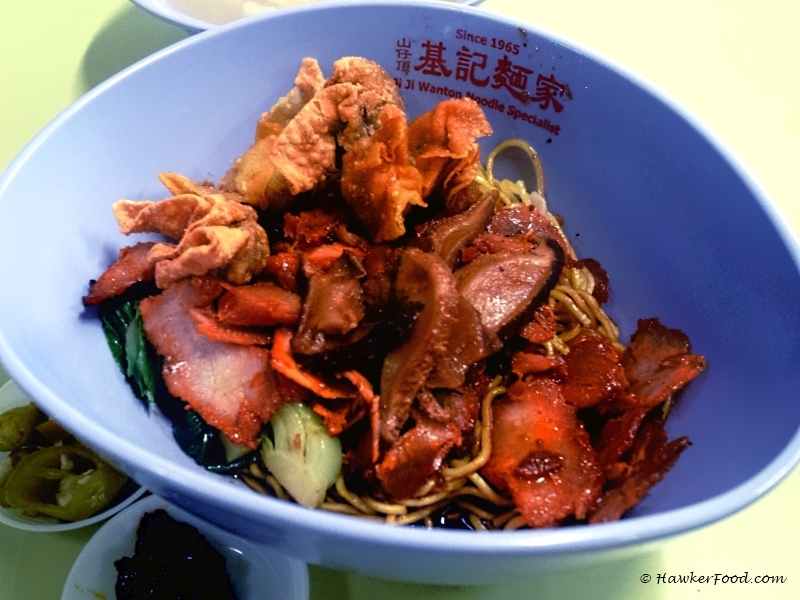 Other than the Char Siew Wanton Noodle, they also have a vast selection of other varieties. Lao Beng had personally tried the Soya Sauce Chicken Noodle which was pretty good but my firm favourite is still the Wanton Noodle. 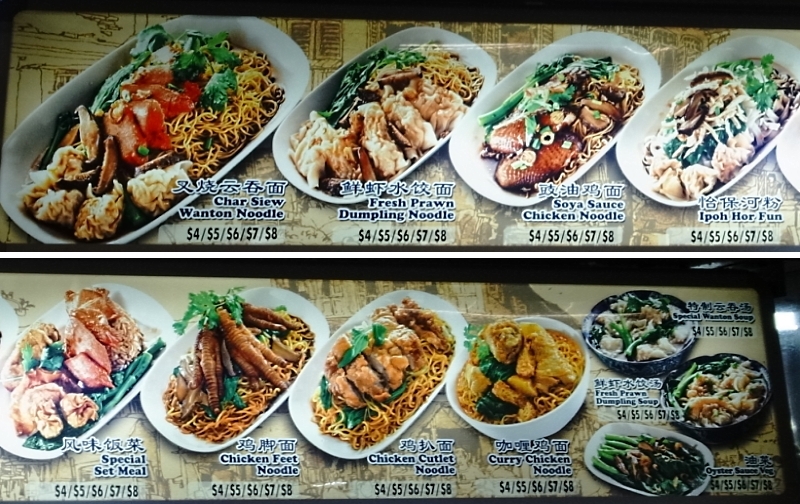 As a patron to their stall for almost two years I would always order the $5 portion for I love to eat more when it comes to delicious food; the normal $4 portion would suffice for anyone. 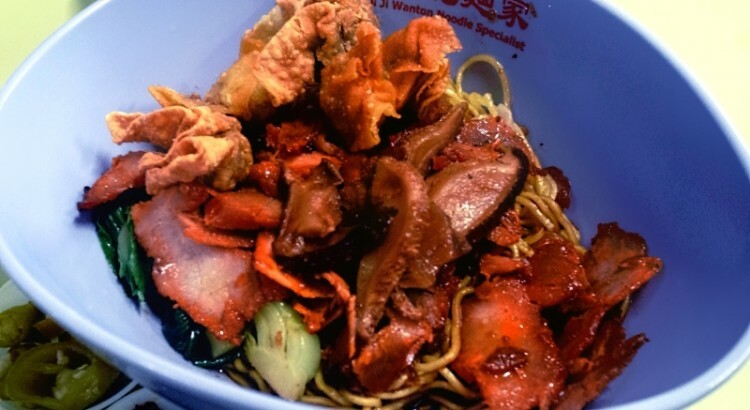 I simply love the noodles with the generous servings of fried wanton (4 pieces), seasoned char siew, mushrooms and vegetables mixed with the dark sauce giving it a wonderful all-round taste. 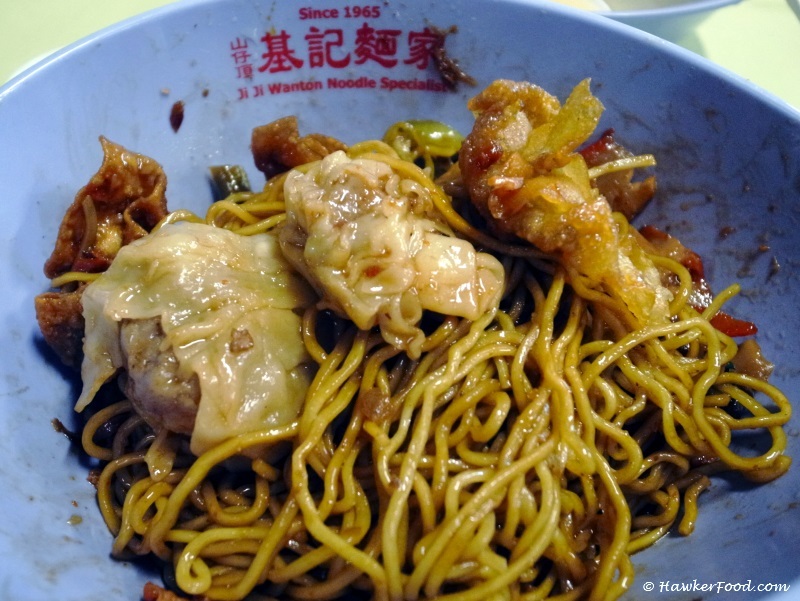 The noodle is unlike those normal noodles served elsewhere, it is specially manufactured by their supplier and its texture was springy and chewy. The seasoned char siew was not over-charred and tasted nice and tender, mushrooms were braised nicely and easy to chew. 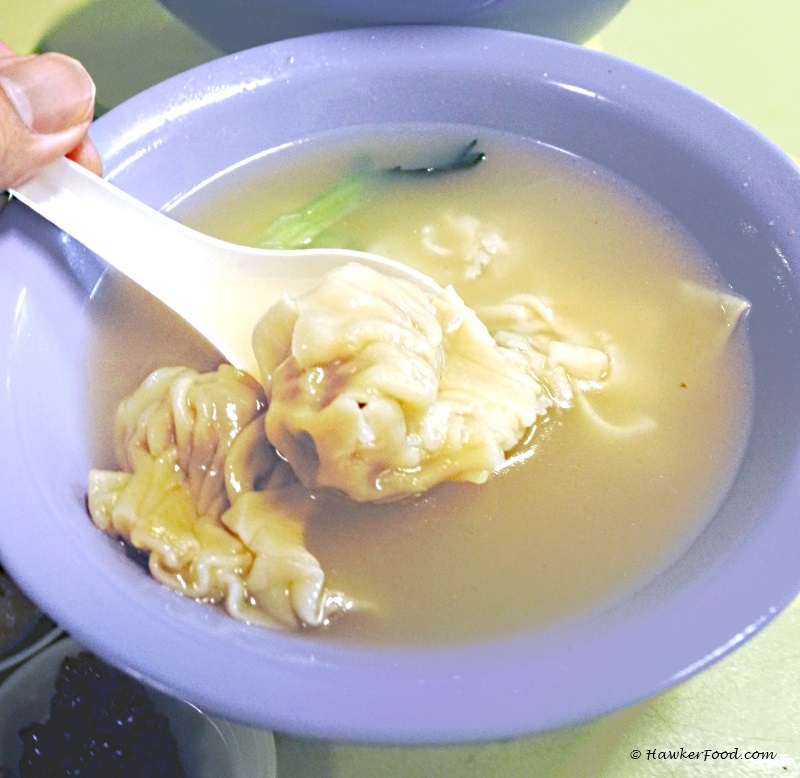 The sweet and smooth wanton soup came with two large wantons and three small wantons. The large wanton on the left with chock-full of meat followed by the small wanton and crispy wanton. Basically they all tasted pretty standard but you could definitely taste the freshness in them. Unique, delicious Wanton Noodle that stands out from the others, the ever long queue is testament to their hard work for three generations. Do patronize them and give their Wanton Noodle a try.